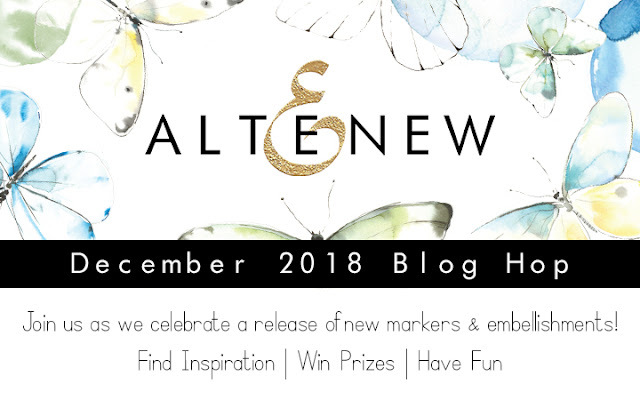 I'm super excited to join the Altenew December 2018 Artist Markers Set E + Scrapbook Embellishments Release blog hop! You should have arrived here from the Altenew Scrapbook Blog! When I saw the products in this release for the first time I wanted to do a happy dance, because you guys, ENAMEL DOTS!!! They are my all time favorite embellishments and I especially love the ones where you have one color in different shades in a pack! And that's exactly what Altenew did here. They are even matching their ink colors! I die. So most of all, I wanted to create something colorful! I also wanted to use the new Artist Markers Primary Colors set because it's so fun and full of color and life! I went with some of my favorite stamp sets: Leaf Canopy and Ditsy Prints. Both are perfect for some simple, flat coloring as they are small images. First I created two A2 size top folding card bases. I then started stamping onto an A2 size white card stock panel. I used black ink to stamp my main images and light gray ink to stamp some of the solid images in the background. I stamped my sentiment in black too. I then quickly colored in the leaves. I decided to add some pencil details to them too. To embellish my card I used a few enamel dots in different colors. On my second card I did pretty much the same thing, but here I used a few shades of gray ink for the background pattern, since this is a layering stamp set. For my focal image I used black ink, the Artist Markers and some color pencils. This time I white embossed my sentiment on a wide strip of black card stock. Notice that I totally messed up the stamping at the bottom, but by then most of the card was already ready and I didn't want to waste it...This wide sentiment covers up some of it and distracts from my mistake. That's what I'm telling myself anyway hehe! A bunch of beautiful enamel dots finish off this card too. On my third card I used another scrapbook embellishment, namely a wood veneer word. 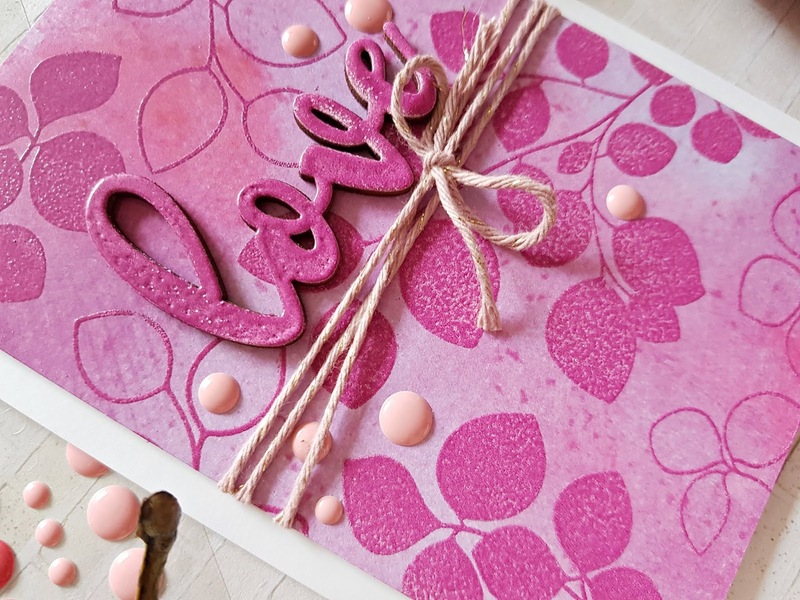 I embossed LOVE with the gorgeous Razzleberry crisp embossing powder; I added two layers for a better coverage. I cut a piece of patterned paper (from the Reflection kit), slightly smaller than my A2 size card base. 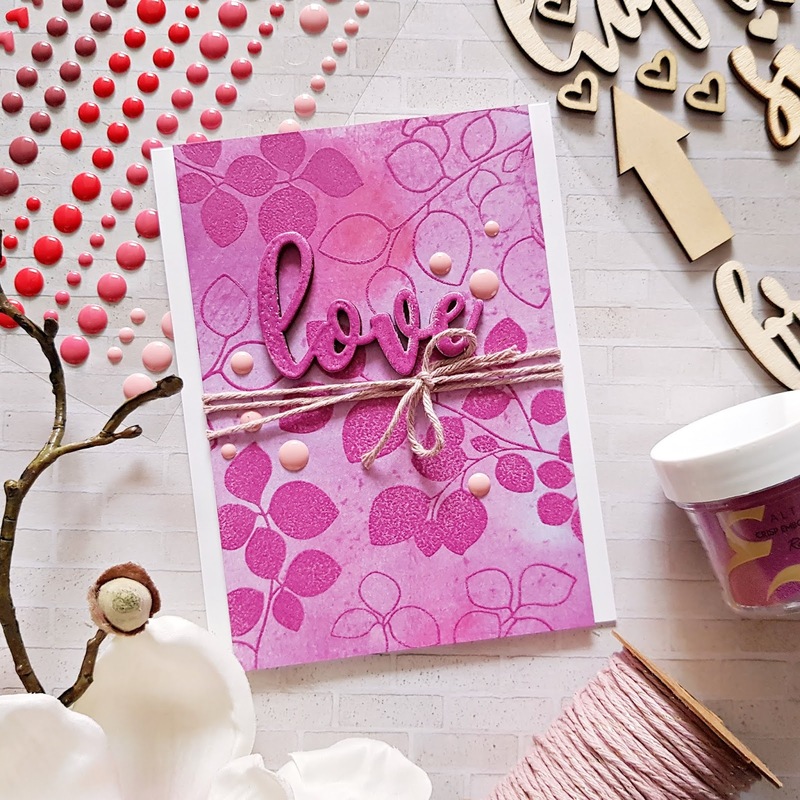 Using the Leaf Canopy stamp set, I embossed this patterned paper with the same Razzleberry crisp embossing powder. I love the monochromatic look! I wrapped some mauve/gold twine around this panel and using foam sheets, I mounted it on my card base. I glued down the wood veneer and added some light pink enamel dots, done! And now...Giveaways, yay! Read on to find out how you can win! Good Luck! 1. To celebrate this release, Altenew is giving away a $50 gift certificate to 6 lucky winners! Please leave a comment on the Altenew Card blog and/or Altenew Scrapbook blog by 12/12/2018 for a chance to win. 6 winners will be announced on the Altenew blogs on Sunday, December 16th, 2018! 2. I will also draw a winner to receive a $30 gift certificate! I will announce the winner on 12/12/2018. Comment away!!! Thanks so much for stopping by today! Your next stop is Virginia Lu's blog. I'm just loving these new products. Great cards. 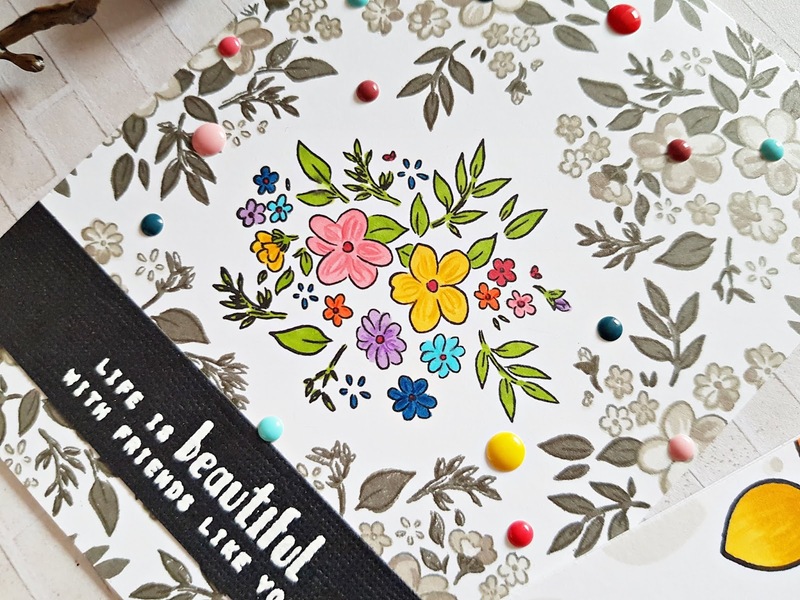 I love those embellishments and of course the new markers are gorgeous. Beautiful cards! :) Love the rainbow colors. What an amazing array of beautiful cards. It makes me think I need those markers. I love how you did different takes, delicate and bold and bright. You stretched the possibilities of the products and made them more relatable for every kind of crafter. Wonderful post. I love these bright and happy leaves! So cheerful and fun! Such a wonderful set of cards!! My favorite is the colorful leaves one. It is so bright and vibrant. I think I need to buy those markers!! Loving the colors in the markers and those darling dots!!! I love how playful and fun these cards are. I’m inspired! Your coloring is FABULOUS! I love the rainbow coloring! I love your cards! Beautiful colors! Beautiful cards and so colorful! I love these cards - the colors are so vibrant and cheerful! Another favorite of mine along the hop! The Leaf canopy is one of my favorite stamp sets and your card is so inspiring! Love the way you stamped the neutrals AND the gorgeous colors!!! How beautiful. I love the pink card. Very pretty cards. I am loving that leaf canopy set. The bold coloring looks so cheery-perfect for a dreary wintery day (It's spitting snow here). The cards you colored with the new markers are truly lovely. But my fave color is that shade of pink on the last canopy leaf card and your technique of stamping the outline first and then the solid leaves is spectacularly gorgeous. I am so glad I have that set and I am definitely going to case your card. Thank you for sharing your ideas and talent. great ways to see two stamp sets I own and love. thanks as always for sharing. The cards are really gorgeous! I love the new release! Oh I just love the bright ans happy vilots you used. Lovely! Your cards are so beautiful! I love the new markers colors released this time!! I am totally hooked on the technique on the Leaf Canopy! 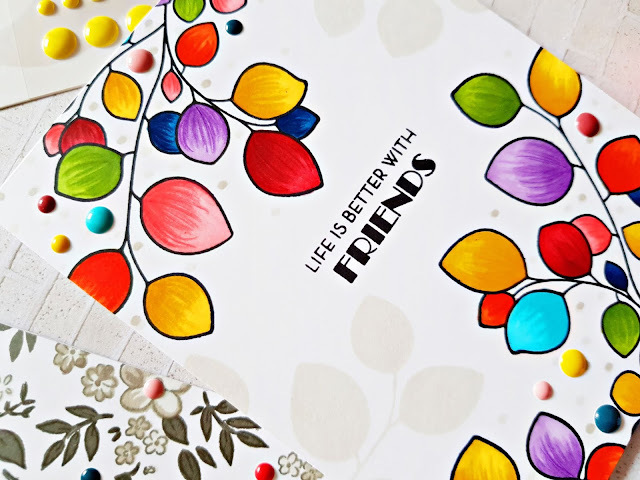 Beautiful series - the monochromatic card with the leaf canopy set is lovely, and so is the rainbow leafed version too - I love those pure bright colours of the markers. I love all three of these cards. The combination of gray and bright colors on the first two cards is gorgeous, as is the tone-on-tone look of the last card. Thank you for the inspiration! Very pretty cards! Love the pops of color on the first two cards. These are such lovely colors. The purple card is gorgeous! Love the tone on tone and the design. Such pretty cards! Really like a spot of color on the grey background. Love each of these, and yes, the enamel dots look perfect there! You and Lydia were clearly channeling the same inspiration on the leafy canopy cards! And your addition of the neutral solids in the background are really cool. As for the enamel dots, I love it when product lines match well; it makes it so much easier for color-challenged me. Thanks for sharing! I have to tell you that your cards stole my heart. They are a delight to my eyes. I love all the techniques you have used. Bright colors in the first one, spotlight in the second card and monochrome scheme in the third one, I love them all. Even I am crazy about these enamel dots. Great inspiration. Absolutely love the vibrant colors and coordinating enamel dots. Super lovely, all of them! The rainbow card is my favourite. I am starting to really love that stamp set you used on the rainbow card - it's so versatile! Stunning cards. I love that you added enamel dots to your cards! They just add a little something extra. Thanks for the inspiration. These cards are gorgeous. I love the colors and the styles are wonderful. I love ALL of the colors you used on the first two cards! And your color blending is beautiful! I love the dots, too. And I'm so excited that they will match my ink colors! Yipee! Your cards are so beautifully colorful. I love how you did each of them. My favorite has to be the last in the hot pink. Great idea to emboss the wood piece. Thanks for sharing these! gorgeous cards, love the bright and cheerful colors. Such colorful and fun cards! Gorgeous cards! Love the wonderful colors. LOVE your CHEERY and VIBRANT colours, such pretty designs too! How beautiful!! I love the different ways you have used these beautiful leaves! I think the rainbow colored one might be my favorite. luv the happy colors! and beautiful "love" card! 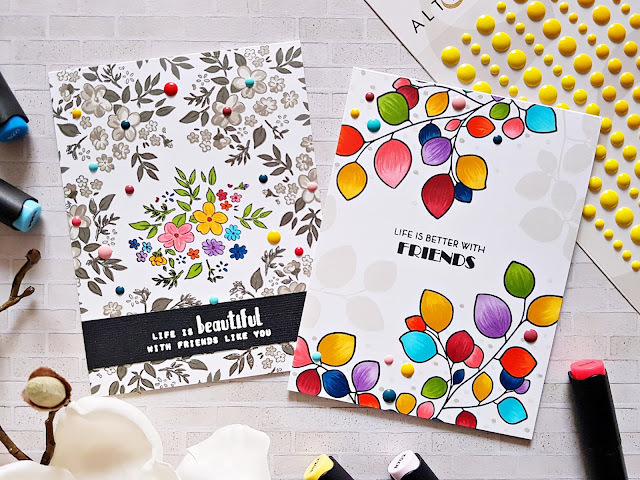 Gorgeous, bright and happy - fabulous cards! The Spellbinders December 2018 card kit is here!